Whatever you need in Smalltalk—tools, services and full support—Cincom has it. 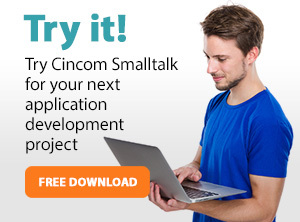 We’re sure once you’ve experienced Cincom Smalltalk for yourself, you’ll fall in love with it. We’re pleased to offer the current PUL versions of Cincom Smalltalk for your personal use. Maintenance releases of Cincom Smalltalk are available to current customers ONLY. The Personal Use License fits the needs of the community, contributors, and citizen developers using Cincom Smalltalk products. It makes it easy for someone to learn and become familiar with our technology. The Personal Use License is intended for usage by individuals of Cincom Smalltalk software for their own private access and use. A public Store Repository is now available for group projects, code sharing, and donations. Store is an integrated source code management and version control system for team development in Cincom VisualWorks . Store can use a variety of popular, commercially available databases systems (e.g., Oracle, SQLServer, PostgreSQL, SQLite3, and DB2). Here you can find all of the contributed components available with our current product offerings. Although some of these may have active external maintainers, these contributed components are not supported by Cincom. Here is the list of reserved top-level NameSpace names in VisualWorks 5i and subsequent releases.